When I had Zander this past winter, a friend brought over some homemade baby wipes. How did I NOT know about homemade baby wipes before my 4th child?! Not only are they cheap and easy to make…they are also waaay better for your chubby baby’s bottom than the store-bought wipes. 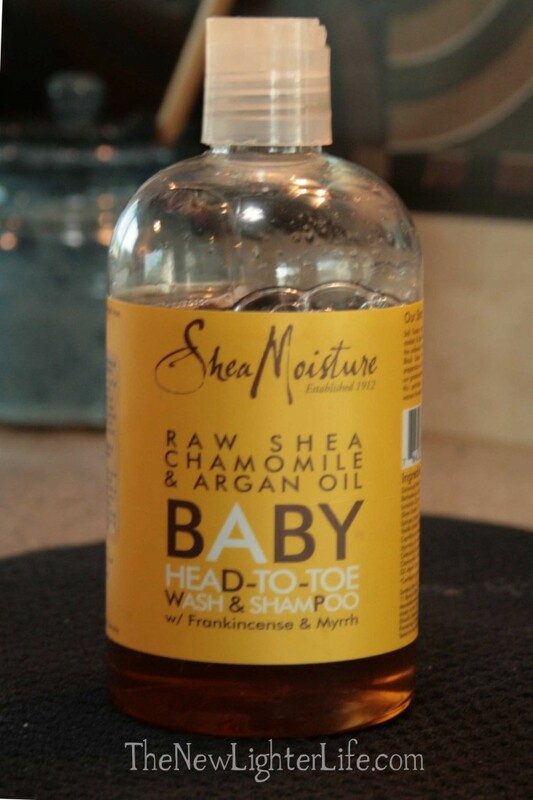 Mix the baby wash, oil, & hot water around to make sure the wash and oil are evenly distributed. Pour the mixture into your wipes container. Add the cut paper towels and let sit for about an hour until all the liquid spreads throughout the paper towels. To make them more travel-friendly, I take a hunk out and put them in a quart-size ziploc. It’s unbelievably easy! And I simply love this particular brand of baby wash which I bought from Target. Best part about these…they do not contain alcohol and they are super-soothing for those delecate areas, especially if you’re dealing with a diaper rash. Just make sure you get the right size Bounty. I bought rolls that were too big once and I couldn’t fit them in my container. I used homemade baby wipes for the 4+ years that Rachel was in diapers 🙂 (Yes, she is finally potty trained at 4 1/2, what a kid!) I loved them!! I always bought the select-a-size Bounty towels – and yes it has to be Bounty! I never tried to take the cardboard out before making them, I always waited until it was all soggy and super easy to pull right out of the middle. Also, I would put the wipes in cut size down (it was pretty rough since I usually just used a butcher knife) and then after about 15 min. I would flip them over to soak up the rest. Worked like a charm! I love your container!!! Mine was a baby shower gift that worked pretty well but wasn’t quite as neat as yours. Thanks for sharing! an empty similac (baby formula) can works perfectly, or an empty huggies/pampers plastic wipes box ( store the paper towels laying down, then you peel the wipes off like you normally would with a regular roll of paper towels, from outside in—no need to remove the cardboard with this approach). i’m going to decorate the similac can with some pretty paper too. i found the mitre saw to be the easiest/cleanest way of cutting the paper towels. Thank you for the great ideas and tips Audra! I really to do like using a miter saw as well, much quicker than cutting with a knife. Hi i have toddlers and wanted to kmow if you have to use baby wash? No, you don’t have to use baby wash but you would want to use some gentle soap instead. Yes, Sondra, it has to be a regular size roll. There is one size up from regular that also works but the larger size rolls don’t fit. Hi Amber! Maybe it’s my knife, but when I try to cut through the towels with the cardboard in the roll still it really bogs it down, I am using an electric knife though. Maybe I need to get out my butcher knife and see how it goes. Great tip on flipping them to absorb! Thank you! glad I could help you with this blog post!! 😉 Good to see the recipe was put to good use!! Yes and thank you friend! The perfect baby gift that kept on giving!! I make and use the (bounty) wipes using your recipe. I use them on adult bottoms here at home. The bounty select a size are the perfect size and are effective. We have a septic system so after using, we put them in the trash. It is the paper. It does not break down very easily so it could cause issues. The actual ingredients would not harm the septic system though. I have a day care and have used the bounty napkins for the last three years and I love them. Wal-Mart sells a plastic lidded container that works wonderful. Great to know JaSi! I hadn’t even thought of using the Bounty napkins. That’s handy for sure, especially if you don’t want to have to cut the paper towels. About how many napkins do you use for this recipe? I see the napkins come in 200 counts, but wasn’t sure if we should only do like maybe 50 napkins for this recipe? Thanks! Yes, 50 is a good start. A lot of it is personal preference so if you want a more moist wipe, less napkins. I’ve been making these for a couple years as well. I use Viva select a size and they work well too. I double your recipe though. I use 2 cups of water, 2T wash, and 2T oil. You can add a couple drops of tea tree oil too to make it a little more anti bacterial. I LOVE them and they are soooo much better for baby’s bottom. 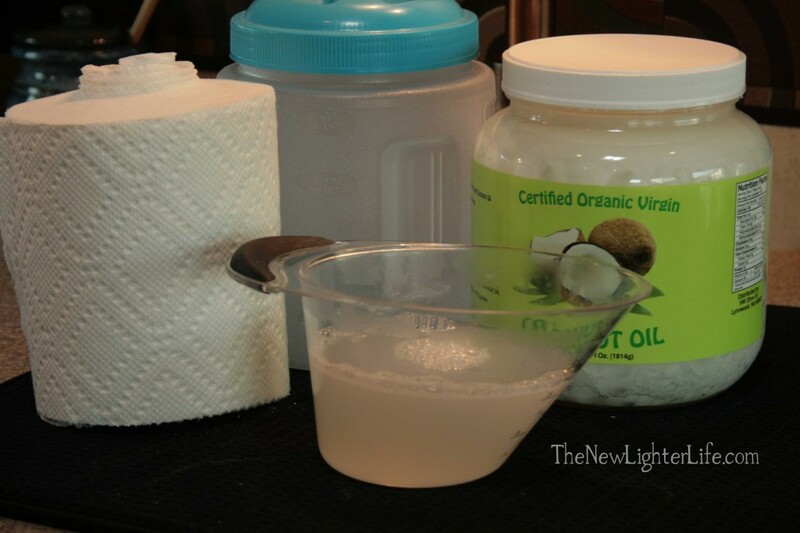 I’ve been using unscented baby oil, but I’m going to switch to coconut oil now! Glad someone else uses them too! Have fun! I didn’t realize Viva worked too so it’s great to know that there are other options. I had previously tried the Sam’s Club brand, Member’s Mark. They were a failure. I have heard of adding the tea tree oil and it is an excellent addition! Thank you for the comment! I just made my first batch of baby wipes, and used the viva paper towel, and they are just falling apart when I try to take them out! might have to try bounty! Oh that stinks, Bounty is the way to go!!! Hope you have better luck next time! Could you use these in a warmer? How would u cut them? If you use a warmer, I’d probably add a couple drops of tea tree oil to the liquid. If the wipes are warmer there is more potential for bacteria to grow, hence the addition of tea tree oil. JaSi mentioned that they make Bounty napkins which I have never personally tried. Rather than trying to make the paper towels work since they are such a different shape, I’d personally try the napkins. Bounty seems to be stronger so I’d stick with those brand napkins first. You are right Michelle, thank you! Except if you live in a high mold content enviro like we do (mntns of western north carolina). My wipes were growing pink mold still, but are now fine w/ the addition of tea tree. So happy you found a good addition with Tea Tree oil! Where can you find coconut oil? Hi Marlena, you’ll find that many stores carry it now, which is so nice! If you look in the baking section it should be there, but sometimes it is in the ethnic section. I’ve seen the brand LouAnn or and Spectrum (which is a better quality). do you use unrefined or refined coconut oil. You can use either, but I use unrefined. Trader Joe’s sells organic coconut oil at a very reasonable price! We buy ours at Costco. Costco sells coconut oil in a huge jar for $16! Great deal and great for many other uses 🙂 Cooking, hair treatment, makeup remover, moisturizer and as someone already mentioned, which I have yet to try, diaper rash cream! Very excited to try making these wipes 🙂 Great baby shower gift as well! Hi! I will definately trying this! My kids are 4 and 6, but I find that baby wipes are amazing in all kinds of different way! One question though…teaspoon or tablespoon? or does it matter? Thanks for the post! Hi Ashley, you’ll want to use 1 tablespoon of oil and 1 tablespoon of baby wash for the correct proportions. I use them for wiping up dirty faces and in the car for my older kids and they work great. Best wishes! I’ve tried the 1:1:1 portion but it didn’t wet the ones in the middle or bottom and I ended up doing 4:4:4 for the whole roll of bounty. Will it do any harm? No, just might be too wet. We don’t have a Trader Joe’s nearby but oh I wish we did! I’ve never even stepped foot in one but I hear they are great! That’s another source for others to check out though. Thank you Jessica for the tip! This is absolutely safe for cloth diapers/wipes. We go through the paper towel wipes quickly so I don’t add tea tree oil, but you may want to if your solution is going to stay on your wipes for a while. We also used these with cloth diapers. I used the same solution on cut up pieces of flannel so I didn’t have to pick wipes out of the wash, I just threw it all in the wash together! Hi, Love this tip. We use the walmart baby wipes by the case but we are always trying to save money. My question is about the baby wash. Could I use Johnson & Johnson head to toe or is there a different type of baby wash I don’t know about? You can use J&J baby wash. I posted the Shea Moisture brand but that’s just my personal preference. As long as it’s baby wash, it’s delicate enough to use for wipes. I know this was posted nearly a year ago, but I would personally NOT use Johnson & Johnson..especially if you are trying to stay away from harmful chemicals..look them up..all sorts of bad stuff in them. Their wash dried my baby’s skin so bad..I switched to an organic wash and it’s a million times better. The Arbonne Baby Wash is the ONLY one I’ve found that has ZERO harmful chemicals. You need to buy from a consultant, but you can look it up on http://www.arbonne.com. I will only use Arbonne on my baby. I am making reusable baby wipes out of fleece material as gifts but they recommend not adding the solution until you are ready to use the wipes. Do you know if it is a problem if these sit very long? The baby shower is now but the baby is not due for a while yet. TY! When I got the wipes as a gift from a friend, she gave me a prepared roll of wipes as well as a bottle of baby oil and baby wash, 1 roll of paper towels cut and her recipe. I changed up some of the ingredients because I wanted the added benefits of using coconut oil. So maybe you can include the ingredients and directions so she can make them once the baby is born? That or you can also add a few drops of Tea Tree Oil to the mixture and try it, But if for some reason mold grew in the amount of time until the baby is born that would not be a good thing at all. Personally, I wouldn’t risk letting them sit for a more than a month or 2 in the wash solution. Hopefully this helps you in making your decision. Yes, I agree! I made that mistake and made up the wipes and gave them at a shower. Fortunately it was a good friend and when she was giving me a tour of her nursery I saw the wipes sitting out and noticed there was mold! So I quickly snatched them, apologized and replaced them with the ingredients instead before the baby was born. I will never do that again! I’m so excited I found your post! First time mom expecting in January…I’m so excited to make my own wipes! So make enough to last and be used within a month or so?! It seems super easy! Could even have the solution mixed up prior. You got it Lauren! 🙂 Congratulations! I made these when my son was born (June 2012), I started having issues with them molding, did anyone else have this issue? I was tossing a bunch out, which wasn’t making it very economical, we switched to the Seventh Generation ones. I LOVED the way these smelled, worked, felt, etc, but it isn’t worth it if they are constantly molding. Any tips?? I’ve never had a batch mold in the 1 year + of using this recipe. But you’re right, it sure doesn’t make them very economical. Were you using coconut oil Megan? Coconut oil itself is antimicrobial, antifungal, and antibacterial so that is what makes these wipes that much better. That and the addition of a few drops of tea tree oil would be a huge benefit. I go through a container of wipes every 2 weeks (but I think they would last mold-free much longer). Time would be the only other factor I would think would contribute to the mold problem you had. Hope this helps you. If you boil your water first OR buy distilled water, it will help prevent the molding and prolong the shelf life! tea tree oil is anti fungal. So is lavender and lemon grass. A splash of white vinegar works as well as bleach but is all natural. As a cleaner, we use vinegar and add a few drops of citrus essential oil. So theoretically, you could add a splash of white vinegar to your mix. A few drops of tea tree. And several drops of lavender. That would keep your baby from smelling like a pickle. And lavender is great on the skin. We make/sell a homemade face wash that has lavender in it and my wife’s skin has never looked better. When we had our first son, my husband actually read up on the effects of tea tree oil on boys. Since then, I’ve been more sparing in my use of it because I think there are valid concerns with overuse. Great information and not something we should overlook. what do you mean?? what can happen to the boY??? Specifically from this link shared in the comments. From that report, it suggests that tea tree oil (and lavender oil) could cause breast enlargement in prepubescent boys. So I was compelled to research this topic again and I came across this article and this article. In my opinion, it’s something to be aware of but not worry about. There is NOT a widespread problem of gynecomastia (breast enlargement) or a link to tea tree oil. But knowledge is power and if you are aware that it could possibly cause gynecomastia, then you can make an informed decision. do you know of any other natural antibiotics other then tea tree oil that would be safe to use in this recipe. I want to try these so bad but I only go though about two packs of wipes a month (I use seventh generation wipes now) and don’t want to make these just to have to throw them out before I can use them on my little man. Initially, I thought Lavender oil would be a good choice since it is anti-bacterial. Here is a link I found with more information on oils you could use in place of tea tree oil. I hope this helps you. I love these wipes and they’ve worked well for our family. Can I use the coconut oil that I bought in the grocery store. There is nothing else in it as far as ingredients, My daughter had twins and this is one way we can save and better for them. Can’t wait to give them a try. Thanks in advance. Yes Peggy, that will work perfectly. Congratulations!! We are just about to run out of baby wipes and my 14 month old has been having diaper rash lately (which he has never had before). Hope this change to a more natural and savvy way of making homemade baby wipes will help him. PS. If you find that you’re having trouble with mold, make sure you use distilled water. That might help the issue. Good luck! Also, it’s funny you mention diaper rashes…my kids all had terrible diaper rashes. But since using the homemade wipes, we’ve not had any issues other then a very minor rashes with the almost 3 year old (because I didn’t realize she was dirty). I hope this helps you and your little guy! I make homemade wipes to have in the car and I have had good luck with Dr. Bronners Magic Soap 18 in 1 Hemp Lavendar pure-Castile Soap. Haven’t used them on a baby bum, but use them on children’s hands and face along with my own use, I find them to be very gentle. Just another thought. Thank you Merri! That is great to hear! I have some Dr. Bronner’s Castile soap but I’ve never tried it in wipes! I’ll definitely give it a try on the next batch. Remember that Dr. Bronner’s is concentrated. I used a tablespoon and found it was too much. I’d recommend using less soap and more water. Not sure what ratio yet, I’m still experimenting. Thank You for this post. I was able to find everything you suggested except I have not bought the bounty yet. The baby soap is expensive but I bought that and I bought myself the adult lotion as it smells awesome. I am making these wipes for my dog actually. To clean his feet and wipe his body. He has very little hair and I have been using coconut oil on him for some time now. Last year he developed a few growths and I was told frankincense will help them shrink so I am hoping this soap will be good to bathe him in too. I am also making some wipes for my exercise class so we can wipe off when we have to run errands after class. I found a very similar container in the dollar tree store only the lid was flat. I was pleased to find they were made in USA so I bought 6 of them. Well I am hopeful that Scott paper towels will work as well as that is all I have at the moment. I have seen those flat lid containers at Dollar Tree too. They are the same size as the one I have, (I think it’s just an updated design). That particular brand, Shea Moisture, is highly addictive. I’ve loved everything of theirs that I’ve tried. As far as Scott brand, don’t be discouraged if they fall apart. They are definitely sturdy enough with Bounty, but I tried another brand before and they fell apart. As far as your pup’s skin problems, this is totally off topic, but have you ever heard of RAW feeding? (the growths made me think of it) Our dog that we had years ago had serious allergies and skin issues. We switched him to RAW food and all of his issues cleared up. He was scratching excessively and losing patches of skin/hair. From what we read, allergies can manifest in all sorts of ways in dogs. Anyway, just a thought you may want to consider. Best of luck to you! These wipes are just amazing. My dog is salivating wanting to eat them. (he loves evco!) There is an article on Organic EVCO and the benefits to dogs in many ways and I assume the same for humans. I understand it is important to use EVCO. Sadly in a rush though I bought the Coconut oil in the grocery although it was labeled organic it is not extra virgin. I will research what the benefits of the extra virgin is over just coconut oil. Thank you for the recommendation for feeding raw. His skin is actually in great condition for a mostly white dog with pink skin belly. He is 7 now and the vet has been amazed with his good skin condition for breed and the fact he is white. The growths just developed recently and were tested to be benign tumor. which seems to be very common in his breed. I have been keeping close eye on them and the article on them in whole dog journal actually mentioned frankincense oil as being a magic cure. When and if he starts to have issues with his food I would switch to Raw, but it just plain grosses me out so I have not tried it. Thank You for sharing these amazing wipes! That I will be sharing with my dog forum. There is a RAW FOOD Called ” I and Love and You” totally not gross! Its actually dehydrated you just at water… And it smells awesome! Well to me it smells like soup! It also has raw veggies in it too! Its amazing! What is the shelf life on these? I want to make some for a friend who is due in a few weeks and I want to try them soon but i dont want them to dry out of shes late or doesnt use them right away. How long do they usually last before drying out? I’m sorry but I honestly don’t know how long they’ll stay moist. They’ve never dried out on me and I think the longest I’ve had one prepared was a couple of months. (I use to have 2 containers and I seemed to use 1 of them more so the other lasted much longer) I’d say at least a couple of months but not too much longer because of the possibility of mold (unless you add tea tree oil – that would buy you some time). Great to know Kristin! Thank you! I hope I don’t sound silly but are you cutting the paper towels in equal halves? If so, this would make two containers of wipes. I nanny for twin 8 month old girls. One has serious dairy allergies and I think is allergic to many other things yet to be discovered. This could definitely help her little bottom. Plus the girls love to grab the wipes and put them in their mouths. At least with these they wouldn’t be taking in chemicals while I get the wipes away from them! Not silly at all Joanne. 🙂 Yes, I cut them into equal halves and one roll makes 2 wipe containers worth. I just cut the entire package all at once and make them as I need them. Hope these wipes help these two little girls. What a great thing that care so much for the little girls you nanny! these are so wonderfu! I’ve been using this same basic recipe with flanel wipes since our son was born 2 1/2 years ago. we use a warmer, and i’ve never had a mold issue. I did want to say though, that only the cold press/expeller pressed oil has all the wonderful benifits to it. if it has been refined, like the LoAnna brand is, you’ve lost most of the benefits. I’ve still used it when it was the only brand I could get one time, but it was not as good on my sons rash prone skin. Great feedback Lois! The LoAnna brand is okay if you’re in a pinch but not something I’d use on a regular basis. Several local stores now carry the Spectrum brand which is so much better. Glad to hear they helped with his rash. Since using these, our little ones haven’t had a rash and I can’t help but think the wipes are why. I started using them on my daughter and they worked great! Just made these tonight to try for the first time. I had to double the liquid mixture though. There was no way there was going to be enough to get the towels all damp enough. You may need to double depending on the size of the Bounty roll. My container is on the smaller side so I need to get a smaller roll of Bounty – I think “BIG”. I’m glad you found a proportion that worked for you and I hope you like them. Love this! I have some questions though. I have everything to do this except the knife or saw to cut the cloths. Do you have any recommendations on this, because I have a Costco bundle of paper towels and I’d rather use those than buying some other ones. Also, could you put the towels & solution in those plastic wet wipes flip top style containers? Or does it need to be an air tight container? I’m really excited to try this out on my newborn! Thanks for the post! Someone did comment that the Costco brand paper towels do work (you just may need to double the recipe as they need more moisture). The only problem I can see is getting them cut to fit a container. Hmmmmmmm. Maybe a larger container? Meaning taller? I think they’d be to large to fit into a wipes container. One other suggestion (which goes against your desire to use your Costco paper towels) is to buy the Bounty brand napkins. Those would fit perfectly in your wipes container and you would not have to cut them. I don’t think they need to be air tight. But Huggies wipes containers have a flexible rubber inside seal at the top and those seem to keep wipes from drying out and would be a better choice. Pamper’s wipes containers have a flawed design where they are more open and prone to drying out. Julie I am so excited to try these wipes. I use coconut oil on my skin and it helps tremendously. I also wanted to tell you how absolutely refreshing it is to see you interacting with each comment on your blog. What a wonderful hostess!! I will certainly be following more of your posts. Thank you so much Megan! Coconut oil is so wonderful and I wish I had known about it years ago. I love the comments and really appreciate each and every one of them. Thanks for stopping by! I can’t wait to try the wipes! I have a 3 month old and have given her daily massages with organic extra virgin coconut oil since she was 1 month old. I slather on a little extra on her bottom and I have not had to use diaper cream since! I also use it as a face moisturizer…well really an all over moisturizer! I do love the power of coconut oil! 🙂 So glad you’ve found it useful. I also use it as a makeup remover (eye area) and have used it in my dry hair in the past. I hope you like the wipes. I’ve had the hardest time finding a container for these. I’ve tried target, wal mart, family dollar & dollar tree! I might go to The Container Store tonight. Any suggestions anyone? I really really want to do this for my baby! You may want to look for a flour container. I think Rubbermaid has one that is wide enough to hold a roll. I used a “click-clack” container we were given when we were married. They are sold at Bed, Bath, and Beyond. Target sells something similar in the laundry area. Great! Thank you for the tip Amanda! Here is the link in case any of you are interested. I got a great container fromTupperware. Not sure if its only a European thing though.. I found a container that fits a double size roll at The Container Store. It is a clear plastic canister with a white lid with a rubber gasket inside for a nice tight seal. It has a one handed operation of opening on the top if the lid that you squeeze together to remove the lid from the base. It had a clear label with a black “swoosh”, was about $12 and was with the kitchen type jars. Good luck! Is there an expiration date? I am such a planner so i like to have everything prepared and i know that with a 2 year old runnign around it would be easier to have them made ahead of time and ready to pull out! I’m not sure about an expiration Abigail, but I’d be careful about preparing too many ahead of time. I have to say that I admire planners like you! But I do want to encourage you in the fact that they are very quick to mix up as long as you have them cut ahead of time. Whenever I get towards the end of a roll, I pull the last remaining towels out and mix up a new batch. Then I place those stragglers at the top of the container so they are ready for the next diaper change. Best wishes! Is Dr. Bronners soap okay to use instead of the baby wash? I would think it is Kristen, but I’ve used Dr. Bronner’s only once (in a tooth soap of all things). From what I’ve read, it is more drying so it’s good that there is coconut oil in the wipes mixture. Maybe do 1 1/2 tablespoons of oil? If anyone wants to add their experience with Castile and Help Kristen out…that be great. I just don’t have experience with it. Thank you for the link Faith. I hope it works out for you! Would these wipes b flushable and safe,for septic? I’m sorry Cathy, but I don’t think they will work for a septic system. The reason being is that the paper towels will not break down enough for the septic. If they are a different paper towel brand that breaks down easier, they will likely not hold together well enough to use. If you were simply flushing them down into a sewer system, you could get away with it. This is so wonderful! I no longer have babies in the house so I use this for me, coconut oil is great for everyone’s skin and the scent is soothing! I do love coconut oil. So many benefits, and you are right it has a soothing scent. Would these work with 3ply toilet paper? One of the stronger brands? Great question! I’m not sure, but you could try it Ali. If you do try it, I’d love to know if they worked. I know lots of people want flushable wipes. We have to buy 1 ply because of our RV living. I used cloth wipes for my LO but stored them in the wipe warmer….so they were always nice and warm! I did mix my own solution something similar as you have described. I just wish I had known these little tidbits with my first two. I so wish I had learned about homemade wipes before my 4th. 🙂 We do love them and use them not just for diaper changes. Can we use this as a face make up remover wipes??? I’ve never tried it Karina, but I will tell you that I use just coconut oil for makeup remover. It works beautifully. I may just try the wipes tonight to see how well they remove makeup. I use coconut oil too, especially when I wear water proof mascara.. I really love it. I wanted to let you know that I have used these wipes to remove makeup several times since your question and I love them! They’ve worked perfectly so thank you for your comment! I would not have thought to use them as such but I’ll be using them from here on out. I just did this and they are AWESOME!!! I used the Kleenex hand towels and a rectangular tupperware container but the exact same mixture. and the hand towels work WONDERFUL. thank you for sharing i love it. I can’t wait to try these, wish I’d seen this sooner as my little one is two. A question for those who use Bounty napkins, is it a pain to have to try to separate one at a time, or do they come out like wipes might? I am wondering if the coconut oil solidifies after the water cools down? Or does it absorb before that happens so you don’t really notice? I just know coconut oil is solid below like 76 degrees and sometimes our house is cooler than that. Has anyone had any issues? From my experience, the towels absorb the coconut oil. When our home is cooler, I just flip the freshly made container of wipes to get an even distribution of the mix. When it’s warmer, it doesn’t seem to make a difference. Best wishes! I finally figured my solution out using your recommendations- thanks for the help!! I use Costco brand paper towels, cut them in half with an electric knife ( great suggestion on here), put in plastic lidded container with 3 C distilled water mixed with 1 tbsp Dr. Bronners Lavender Castile soap and 1 tbsp Organic Coconut Oil ( from Trader Joe’s). The half roll lasts a little over a week for my infant and 3 year old. Yes, can you believe my 3 yo still is in diapers! Not for long, we’re going gonzo-commando training this week! I love love love this and wish I would’ve been doing it longer. Thanks again! Ha! Yes I can believe you have a 3 yo in diapers. Our 3rd child was the hardest to potty train. I was convinced that she would be wearing diapers at her wedding someday. But alas…she is finally potty trained. “Gonzo-commando” LOVE IT!!! So glad you found a solution that worked. The water is a definite variable depending on how thick your roll of paper towels are. I wondered how castile would work and I’m so happy you shared your results! Thank you!! I was so excited to try this I cut a partial roll of Bounty in half with some big metal scissors after removing the cardboard. I made up a partial batch of your solution, using baby oil instead of coconut oil until I can get some. Instead of pulling them up through the middle, you can pull them the normal way you pull paper towels and use them like that in an empty Huggies wipe container and they work beautifully. My partial roll fit fine, but once they are saturated, I assume a full small roll would also fit. I love how they come out the top connected and you can tear the wipe off in the size you need. Thanks! I’m glad I saw your comment; I was just about to ask if using an empty plastic wipes container works well! Thanks! How much money does this actually save? I would love to try and make a big batch of these since I have 2 littles in diapers still. Plus I use wipes for other things all the time too! And I have all the ingredients except the paper towels! I like the idea of tea tree oil, and the coconut oil has anti-bacterial properties as well. Excited to try this! I’m sorry Sarah, but I’ve not worked out the cost comparison perfectly. The cost and size of Bounty rolls varies quite a bit. In a very simplistic way, I look at it like this. For $14 I can buy an 8 roll package of paper towels which get’s me 16 batches of homemade wipes. Each batch is 77 sheets/wipes. So for $14 I have 1,232 wipes, or $0.01/wipe. Of course you’d still need to figure in your your soap and oil. Cost for Bounty (and other good brands) varies so much as does the coconut oil, baby wash, & tea tree oil. But even with those added in, they are still less expensive (and healthier) than storebought wipes. There really is a huge price variance, depending on sales, but I make my wipes for next to nothing. CVS typically runs 12 smaller rolls of Bounty for $7.00 (after rewards money). I buy mine when they are at their lowest price, which is around $4.50. There are 912 “wipes” in the bundle. CVS and Rite Aid typically run two sales a year during which you can get baby wash / soap for free or less than a dollar. (I’m still working through bottles I bought years ago.) You will use approximately one bottle per bundle of (12) rolls. I use vinegar instead of oil (to help with mold), at the cost of perhaps $0.50 per 12 rolls. The lowest price per wipe at Wal-Mart is $0.02 cent per wipe, which means it’s almost a $10 difference between a box of 900 wipes and making 900 wipes. Since so little tea tree oil or coconut oil is used, you could buy some pretty expensive oil and still come out better off. I coupon all the time to keep the price of baby necessities low, and I have never regularly couponed a cheaper type of wipe. Thank you Melissa! What a great breakdown, this is so helpful! How long do your wipes last before they mould? I just bought a new baby wash — Yes to Baby Carrots — and it’s a foaming wash (as in it foams when you push the pump). I’m thinking one or two pumps would do it for the solution, what do you think? I want to try this! I think 2 pumps would be a good start Jennifer. Maybe up the soap if you find the wipes don’t wipe the dirty diapers well. Foaming soap is quite a bit diluted compared to regular baby wash. Also, there is leeway in making your wipe solution. Best wishes! That’s what I was thinking, too, thank you! I love the wipes solution, unfortunately I did not have coconut oil, only organic extra virgin olive oil, so I used that for my first batch. I already use the Kleenex brand disposable hand towels, and they are pre-folded to pop out of the dispenser. So I opened the container from the top, put them into my empty Huggies container, poured the solution over top and viola! pop-up baby wipes. So far they seem to be holding up quite well. Thanks again for the recipe! You’re welcome Lisa! Glad to hear that the Kleenex are working for you. I’ve use olive oil in a pinch and it does work, but coconut oil is my preference. Thanks for stopping by! Does it matter what sort of coconut oil I use? Virgin, extra virgin, regular? There are too many kinds online to choose from. Thanks! It can be any one of them Chelsea. I like to order Extra Virgin because I use it in cooking as well. 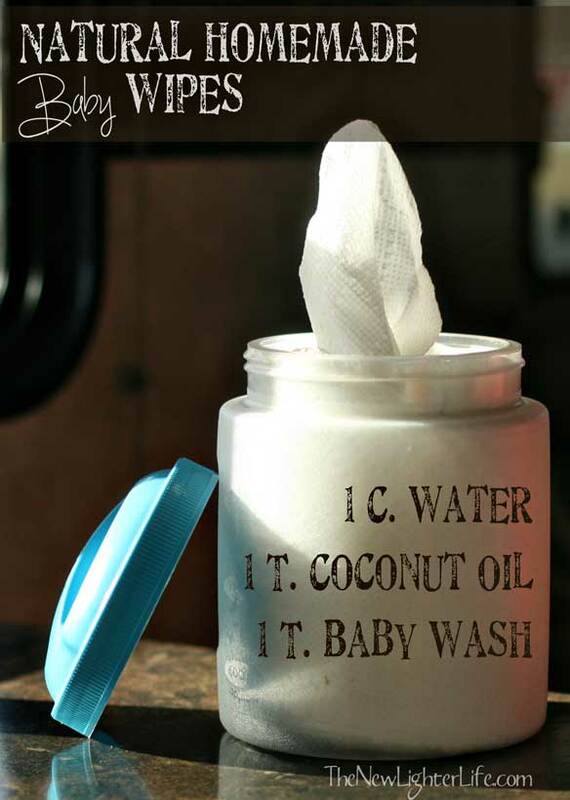 I love this idea and although my baby just turned 7, we still use wipes. I keep them in the car and use for after pumping gas or when we eat or come in from a store, etc., to clean our hands. Since I leave a container in the car, and they aren’t used everyday, do you think that would be a problem in storing them? I’m reading the various posts about the mold, I would in fact add TTO because I do have it on hand, but i’m wondering about storage in a container in a vehicle. Thanks. so glad I found this. I can no longer find the brand I once used, and the prices you pay to get a good sized box of them is ridiculous! I’m not sure about storing them in the car, Maryanne. I would think that adding the TTO would ward off any mold but vehicle temperature would be a variable. You may also want to use distilled water in your batch. Best wishes! What wold the alternative of bounty be in australia ? I’m sorry Vic but I’m unfamiliar with the brands available in Australia. I’d start with the most heavy-duty paper towel you can buy and go from there till you find one that does not fall apart when the wipes are prepared. Made these today and used them for the first time. Worked like a charm! I added a few drops of jojoba oil with the coconut oil in the solution for extra skin conditioning, and later read in the comments about adding tea tree oil, which I’ll skip for now as I read of the possible effect on boys (I have two sons). Does anyone know if the jojoba oil has any risks healthwise or if it is detrimental to the antifungal properties of the coconut oil? Hope not! I made the wipes exactly as directed on 9/14 and noticed today that mold is growing in the container!! Any suggestions or ideas on what I did wrong?!? 1. Was your container completely clean? 2. Are you in a humid/hot climate? Great idea Brandi, I’m going to have to give the aloe a try! Thanks for stopping by! Tea tree oil is very potent. Hello, I just wanted to drop in and let everyone know something I found out once about paper towels. My dad actually worked for Kimberly-Clark (producer of Scott brand paper towels and Viva) and he has told me there are a lot of dangerous chemicals in the paper towels. (I was using them to smooth out icing on a cake to achieve a fondant like finish and he told me this because he didn’t want me eating the icing after he saw me do that). So if you are doing it to save money it sounds great but if you are doing it to reduce chemicals you might not be achieving much. Maybe a Better option to reduce chemicals would be to make organic cotton reusable wipes for #1’s and then just use these homemade hdisposables for the #2’s. Just my thoughts after hearing the comment from my dad! I think Brittany might be referring to the dioxin that has been used in paper mills. I was raised in a city with a paper mill nearby and have endometriosis, which can be caused by exposure to dioxin. (Studies done on Rhesus monkeys show the same.) Many of my friends had trouble conceiving children, which can be caused by that condition. I was so glad to learn I was having a boy instead of a girl because I’ve suffered (and still do) so much. We were all raised with many benefits that would otherwise seem to preclude this type of problem and away from other types of chemical locally that would cause such problems. For example, those raised in poverty often have health problems due to environmental factors. We were raised without any of those issues except exposure to the chemicals from the paper mill, which could not be avoided anywhere we lived, as it permeated the air and probably the water supply. If anything, based on our environments and advantages we should have all been supremely healthy. Now I worry about my son being affected by other chemicals, and what we will collectively pass down to my grandchildren. So, even in his adolescence I still insist he use bath products like Burt’s Bees or others that don’t have possibly damaging chemicals to his hormones. If someone isn’t willing to do fabric for the really messy wipes then just use paper for those and use fabric for the rest; just split the difference by making two batches. One with paper for the really messy wipe needs and another with fabric for the “follow-up” wipes and/or less messy wipe needs. Every little bit of lessening the chemical load helps. Thank you for your comment! Chemicals are definitely something to consider and you bring up a good point along with a solution. Have you ever searched the connection between insulin resistance and PCOS? Here is just one of the links I found, http://www.ncbi.nlm.nih.gov/pubmed/10576524. I wonder if this couldn’t be the cause. A low-glycemic diet, (Trim Healthy Mama is a great one) or Plexus would help to correct the core problem. Just throwing that out there…if you search insulin resistance and PCOS, the connection is startling. Best wishes! hi I am thinking of giving this for a new baby.Any problems with the liquid not soaking thru all the paper towels? I was wondering if it would be better to slowly pour the liquid in from the top once the paper towels are already in place in the container? Sorry for the late reply Allison. You could try pouring slowly but it really does soak in quickly, especially if you flip the container after it sits for a few minutes. Great to hear PJ! Thank you! One cup is for 1/2 a roll. Jen recently posted…Bleach Mistake – Don’t Do THIS! Hope you can find it Jen. I know that Target has nice size Rubbermaid containers, they are less than $10 but in a pinch they work, (just are a little pricier). hi, i love the idea of doing this but i have some questions. do you use refined or unrefined coconut oil. also if putting into a huggies box does it actually work. i just picture it not turning right. i know i see people using bounty, but wouldnt that be a little rough or is it really the best to use. i was just thinking viva is a little softer. does it hold up as well. I use unrefined simply because it’s what I keep in hand most. Both would work just fine though. I’ve not tried the wipes containers because it seems as though they wouldn’t come out easily. Bounty has been very soft and works perfectly. Try Viva and see what you think, I’ve never tried it personally. I tried using Viva paper towels, thinking they would be better (since they are more clothlike). Personally, I found they seemed a bit flimsy and I needed more wipes to do the job well. Bounty has worked beautifully, and aren’t rough at all. I will say that when I used Viva, my container was smaller, which resulted in smaller wipes; now with a larger container I might not have the same issue, but have found Bounty to be a better choice overall. oops! Hit enter too quickly! I was using an old Huggies box (I alternated between that and a Pampers wipes box), which resulted in the smaller wipes. They came out of the container fine, but we just quite small once you cut the paper towel roll to fit. I would find a larger container with a flip-top lid, rather than using an old wipes container. I’ve heard that it’s better to use unrefined coconut oil on the littles. My little is due in October and I am looking into making these. When looking at cloth diapers the other day, I saw cloth wipes…wondering if it would be worth it to try this solution with these? Not sure if you’ve tried that; I’ve seen a few other comment about them. I’m mainly wondering if they would work presoaked. I would sure think so Emily, but the best thing to do is try it. Best wishes! how long will they last? wondering if I could make up a couple at a time and store them. Does the coconut oil get solid again? They will last about 3-6 weeks, depending on the temperature. I would not recommend you make them in advance though as some have reported mold when they sat too long. Okay, so I’m going to make these baby wipes to give as a baby gift for a friend, and I was wondering: how long do these wipes usually last for you? Do they ever dry out after a certain period of time? Thanks! They won’t dry out if the container is airtight but I did have them mold once when I gave them as a gift already made at a shower before the baby came. Now I give the container and all the ingredients with a “recipe card” that tells the new mom how to make them. Or if I pre-make them I will give them after the baby is born. I’m making them as we speak! Will the liquid work its way up the paper towel after awhile? Hi just wondering if you soak both halves with the one solution? And could you use toilet paper for these wipes or would they not be absorbent enough?? No Alana, just one have for each solution. Toilet paper would actually not be durable enough to hold up since it’s made to break down easily. Has to be paper towels. Best wishes! If baby gets frequent diaper rash, you could substitute aloe for the water. Also, squeezing in a few capsules (5-7) of vitamin E oil would help tremendously. Last, if you make a large batch & need to keep one for awhile, put it in the fridge until ready to start using. Will significantly cut down on mold possibility. I just made these yesterday and I LOVE them!! Just to make sure. 1 C. is 1cup and 1 T. is 1 tablespoon ? Hi, this my 1st time making this recipe. I used lavender to soothe, hoping if they have a rash or sensitive skin – it won’t irritate. – it seems too soapy, I tried it on my 2 kids. If I add more water to the mixture, it would help the soapiness? Do you need the baby soap?? Can you just use water and coconut oil? I do not recommend making it without the baby soup. That has some cleaning properties to it that you don’t want to miss out on. Hi there. I tried this and liked the smell and for soft they made baby’s bottom and my have, but I was wondering if anyone else had problems with the coconut oil re-solidifying and clumping up at the bottom? Yes, that does happen a little bit some times. (not sure why) But we used them still and had no problems. Any tips on what sort of fabric to use if I wanted to try cloth wipes? I’d recommend cotton or t-shirt fabric. This is an awesome idea. Just wondering if the paper towels dry up or if they stay moist for a while? HI THERE! I’M IN AUSTRALIA AND WE DON’T HAVE BOUNTY PAPER TOWELS, IS THERE SOMETHING ELSE I COULD USE? THANKS. Any kind of durable paper towel that holds up it’s shape when wet. Hi,I was wondering if anyone has tried castil soap? I just made these and I love them! I’m just overly worried about mold and bacteria growth by letting them sit room temperature. How long can you use them? I used one over the course of a couple of months without any mold problems but you could add some essential oils if there is any concern. No, it doesn’t. It is very diluted and so it doesn’t leave a residue. Hey I wanted to know for the recipe does the “T” stand for teaspoon or tblsp.? Hi, I would like to know what is the BOUNTY toweling texture is like and why only that one works? I live in another country and would like to buy something with similair texture. I want to make these as a gift. Thanks. The main thing to look for in paper towel texture is durability when wet. That is really why the Bounty is recommended, (it holds up much better compared to other brands). I know you posted this 2 years ago, but I just found it and I’m really excited to try it! I have all my supplies, but my only problem is that I’m having a realty hard time finding a container. I’ve tried looking at target, dollar general and Wal-Mart. Do you have any recommendations? Thanks! Do you have a Dollar Tree? That is where I got the container. In a pinch you can also you a Rubbermaid container? Something like this? Anyone tried dr bronners unscented as the wash? I used homemade wipes for all 3 of my babies. Loved loved loved them! My sister gave me the recipe and warned me about the mould problem. To solve that issue, I put colloidal silver in mine. Colloidal silver is antibacterial and antiviral. It is what hospitals put into newborn babies’ eyes to prevent infection. You can purchase it from the drug store, health food store or some MLM companies. Before I discovered colloidal silver, I would only keep some wipes out, about a week’s worth, and put packages in the freezer in zipper bags. The napkins work best for this. That way I could make up a huge batch and not worry about them moulding. If I forgot to take them out in time, all I did wss pop them into the microwave to thaw and warm. Thank you so much for your suggestion Eva!! Yes, colloidal silver would work beautifully!